Big shock, Stephanie’s long-winded, so this is going to be a blog post instead of just a reply for the masses to have to suffer scrolling through (unless there’s a badge for that?). I’ve been stewing on this topic for several days now since I listened to this module on Monday. Self-image is one of my biggest bones of contention, even beyond endurance sports. I have a lot of trouble seeing myself as I am in the present moment. There’s the exercise of narcissistic encouragement of documenting the journey with a lot of photographs to visually compare the changes in myself. Sure, I can intellectually see the physical changes–I couldn’t for a very long time, but when you’ve dropped creepily close to almost half your obscene body weight and are still losing, eventually one would hope that you can see the change with your eyes. Yeah, got that part. I think sometimes the difficulty lies in that the majority of the journey is so far beyond the physical, rooted so much in the spiritual and emotional change, that trying to process the physical is just stunting to me. That’s my working theory at least, and I’m running with it. That whole learning to be comfortable in my own skin thing, it will come, in God’s time. 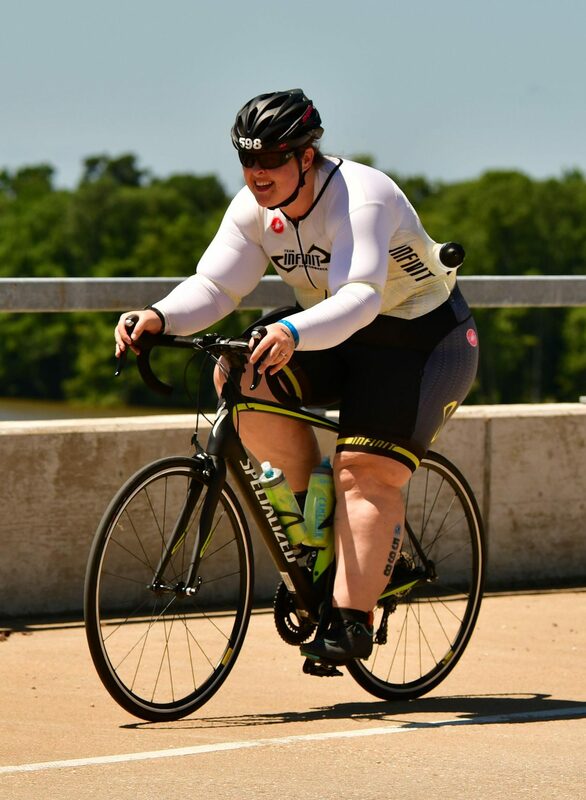 I think that the endurance community has helped me in a lot of ways move forward in my journey of self acceptance and self image. Take the MTP group for example–we are people with an incredible wide range of abilities and goals, but I have yet to see one instance of where someone hasn’t been cheered for, encouraged, given advice, or supported for right where they are not regardless of what level they are at in sport. This is one of the reasons I think I haven’t been a super fan or had the greatest experiences at recreational or short distance races (ie: a community 5k) but have walked away from endurance, multisport, and long distance event (some even DFL) and felt like I was the first across the finish line. Here’s where I see the difference–at the recreational events, it’s just that, recreation and fun (and there’s totally a place for that, I’m not knocking it), but when the fat girl shows up, it’s not an inclusive place. It’s a place of judgment, like I woke up that morning and just decided I would take steps in my life for fitness, health, etc. Not cool. But…endurance sports, that’s a different ballgame. (sans the occasional *coughdouchebagcough*) You show up at the start line, you get a little bit of respect (and it’s still totally fun!!! )–people understand you gave it more than two seconds thought to show up and put in the work to get to that point. Size doesn’t equate ability, it’s a lesson I fight in my own head daily, nevertheless trying to educate the masses too (the latter, an exhausting effort and a fight I’m not sure I’m up for as it’s rather political in nature). I think that’s also the benefit of the MTP. My coach can assign me all the books in the world (and has), and we discuss them ad infinitum, but him saying, “hey, perhaps consider the MTP approach for a cycle or two with the group,” has been a unique experience–it’s brought the endurance race day experience down to a real life place, to see how all of us at every level of cycling and triathlon are working out some of these things on our own lives to conquer some pretty incredible things from simply living and training through cancer treatment to literally climbing some of the most incredible courses in the world on bikes. I have a TON to still learn…I will shake how I currently see myself (which is my former self), and eventually see the reality of the present moment. The weird thing in the picture is the future: I can see the accomplishments. I know what they are–70.3, 140.6, varying ultra marathon distances up to 100 mile (who knows, maybe more? I swore at one point I’d never run a marathon…). Do I know what I actually look like conquering those Mt. Sufferlandrias? Not a clue. But I know I’m going to do it. I’ve come too far not to. Looks aren’t everything. Sure, it would be great to look in the mirror and just see myself. Just see a whole person. Not focus in on the weight left to lose, the sagging skin on my upper arms and thighs that pulls and causes soreness (oh, thank heavens for lycra and compression running tights! ), and all the other things I don’t like about myself. Yeah, I could also get a lot of those things corrected too–crash diets (but I don’t diet and seem to still be doing a fantastic job, so I’ll stick with what works without the crazy head games), excess skin removal (yes, technically medically necessary, but I’m not entertaining it until I’ve lost all the weight I’m going to lose and have maintained it for a time–and even then, there’s a whole place of self acceptance that I need to get to first before I would consider hacking into my physical appearance. That’s only responsible). So, there’s the long-winded answer to a simple question–is my self-image limiting? You bet. I believe though having the goals that I have in play (beyond the physical ones I have expressed publicly) are going to continue to take me to that next level to break past it. When? How? That part isn’t so easy…but the WHY is solid and unwavering, and I’m not going anywhere.